"Unlike the CyPass, the Xen 45 gel stent (Allergan) mimics the outflow pattern of traditional glaucoma procedures by draining aqueous into the subconjunctival space, but with the less invasive ab interno approach. This stent is indicated as a stand-alone procedure or with cataract surgery for patients with open-angle, pseudoexfoliative or pigmentary glaucoma who failed maximum topical therapy or other filtering procedures. 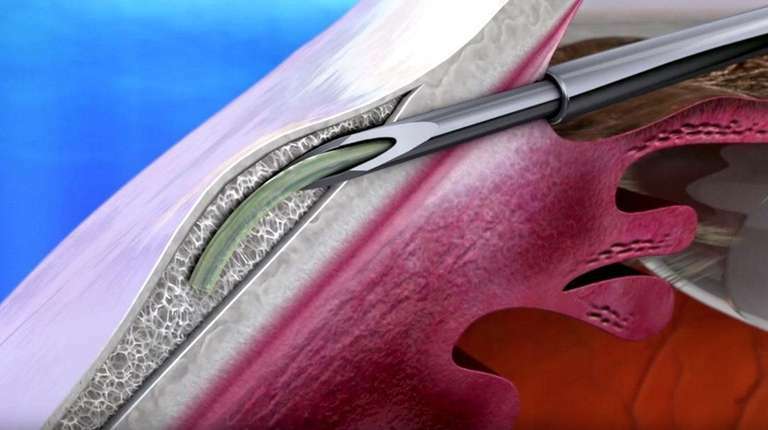 The Xen, preloaded in a single-use injector, is inserted through the trabecular meshwork, creating a scleral channel through which the stent connects the anterior chamber to the subconjunctival space. A clinical trial of 65 patients demonstrated a drop in IOP from a mean of 25.1mm Hg preoperatively to 15.1mm Hg postoperatively, with a reduction in medications from 3.5 before the procedure to 1.7 after.3 "